When I’m packing two kids and myself on a cargo bike for our Mother’s Day Off bike camping trips, I often target the stove and tableware are equipment I can leave at home for a single overnight trip. The equipment can still fit with us on the Yuba Mundo, but simple is nice. Here are some make-ahead, family-friendly recipes to save time and gear for camping trips. These recipes and lots more tips and stories for family bike camping will be in my upcoming book Let’s Go Family Bike Camping. You can sign up to be notified when it’s released on the site. This recipes contains the primary ingredients I like to have for breakfast anyway– oatmeal and bananas– but in a more portable format. Although they are quite healthy, they look like cookies. So my daughter thinks they are a treat when she doesn’t otherwise like to have oatmeal. These took me about 15 minutes to put together and were ready in about 30 minutes from start to finish. I even managed to fit in making them after arriving home from work and before heading out for a quick overnight bike camping trip. 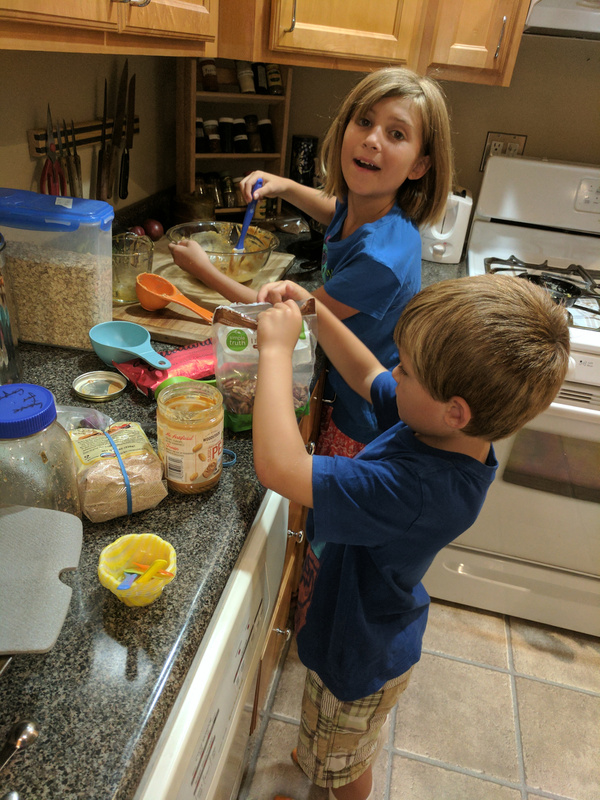 The recipe comes from Dreena Burton’s Cookbook Plant-Powered Families, one the cookbooks we are using to find meals are kids enjoy that without eggs or dairy. The recipe is vegan, gluten-free, sugar-free and oil-free! We don’t stock oat flour– I just whiz some rolled oats in our blender for a few seconds to create some. Preheat oven to 350°F. Line a baking sheet with parchment paper. In a mixing bowl, combine the oats, oat flour, baking powder, cinnamon, sea salt, and nutmeg. Stir through until well combined. Add the banana, vanilla extract, and chocolate chips to the dry mixture, and stir through until combined. Using a cookie scoop, place 2-tablespoon mounds of the batter onto the prepared baking sheet. Bake for 13–14 minutes, until just firm to the touch and a light golden on top. Remove from oven and let cool on pan for a minute, then transfer to a cooling rack. would be about 1/2 cup of oats, and this recipe includes 4 times that. These calorie-dense no-bake trail bars were designed for backpacking– packing the most amount of calories into the the least weight. They are also recipe my whole family enjoys. Consider these as a Clif-Bar replacement for mid-day snacks or even a meal replacement. Credit for this recipe goes to the hiker named “Bigfoot” who got the recipe from hiker “Even Keel” whose mother mailed him these bars on the trail. Thanks, mom. Search for “No-bake trail bars” to find more variations. In my test the recipe made about 20 small bars, enough for our family our four to have each have two or three small bars for a breakfast, with eight bars left over for other snacks. For a two person single-overnight, consider cutting the recipe in half. Our kids loved helping to make these. This increased their investment in trip and their excitement about adding the sweet, chocolately creations they helped make. Beware the bars are a little sticky– probably not the best choice to eat straight out of a handlebar bag while riding! Add remaining ingredients and mix them in. Lightly spray a pan with vegetable oil.